Environmental, quality and plant managers responsible for reporting gas emissions from stacks and chimneys per European CEN or MCERT directives will find that the rugged MT91 Multi-Point Gas Mass Flow Meter from Fluid Components International (FCI) is now their approved solution. In accordance with the latest CEN and MCERTS guidelines, FCI’s Model MT91 Flow Meter has been tested by TÜV Rheinland Germany and found to comply to EN 15267-1: 2009: EN 15267-2: 2009: EN 15267-3: 2007 and EN 14181: 2004. TÜV, an internationally recognized body for approving emissions monitoring equipment, assures FCI’s customers with independent approval that the MT91 Mass Flow Meter meets its specifications, complies with these directives and is suitable for reporting per these directives. 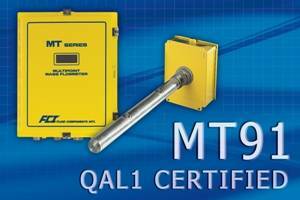 The MT91 is specifically designed for gas flow measurement in large diameter pipes, stacks and ducts. It is a multi-point system capable of averaging up to sixteen (16) sensing points placed strategically across a stack’s cross-sectional area. Incorporating FCI’s precision no-moving parts thermal dispersion sensor technology it delivers direct mass flow gas measurement with virtually no maintenance over many years of service for an exceptionally low life-cycle cost. The MT91’s fully temperature-compensated flow sensor electronics are highly stable with almost no drift for excellent accuracy and repeatability with configurations available for operation in high temperature environments up to 454°C. FCI’s highly versatile MT91 flow meters feature a wide turndown range available from 5:1 to 100:1 with flow sensitivity from 0,08 NMPS to 46 NMPS. The sensor assembly is available with flanged, threaded and retractable process connections with an IP66 rated (NEMA/CSA Type 4X) junction box and installed at the desired location with a choice of popular process connections.